ARTIST STATEMENT: At Allamakee Wood-Fired Pottery we produce simple, functional pots for everyday use. Each pot is hand-thrown by the two of us out of durable stoneware clays. We have no assistants or apprentices. 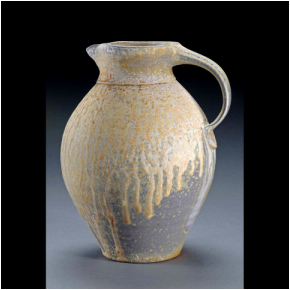 Glazes and slips are applied at the leather-hard state and patterns are created by wiping through the wet surface to reveal the clay underneath. Additional decorations may be added before glazing by stamping, carving and/or incising the surface of the pot. Many pots are also left completely bare to showcase the colors and surfaces created by the wood-firing process. We use as many indigenous clay and glaze materials as possible, such as local clays, granites, and wood ash from our furnace. These non-commercially processed materials have a wider variety of particle sizes and impurities that give the pots more character and a sense of place. They also react with the atmosphere in the kiln to give a wider palette of color change and surface quality it is our goal to create hand-made, functional pottery that keeps the old idea of beauty in function alive with strong, wood-fired forms.